Inclusions: Stainless steel fridge, stove and dishwasher, front loading washer & dryer, 42" wall-mounted Samsung LCD TV, fireplace, Hunter Douglas window coverings, all curtains and blinds, shelving in ensuite storage, master bedroom wardrobe armoire, balcony table and two chairs. Hello Gorgeous! Spacious, Beautifully Upgraded Condo! They just don't build them like this anymore! 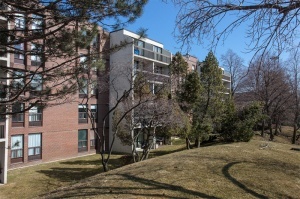 Rarely available HUGE 3 bedroom condo feels more like a house than a condominium. Thoughtful, endless upgrades leave you with nothing left to do but move in and enjoy! 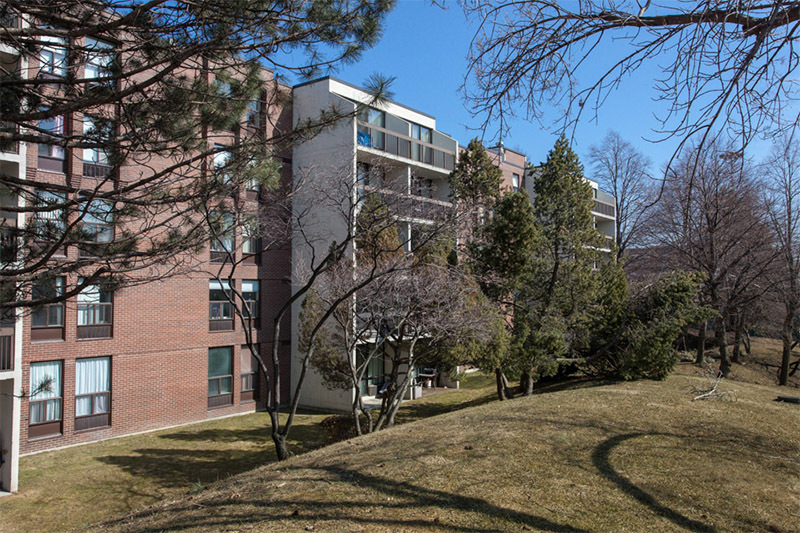 A boutique, 5 storey building in a desirable uptown neighbourhood surrounded by vast parklands, million dollar homes, excellent shopping, schools and TTC. 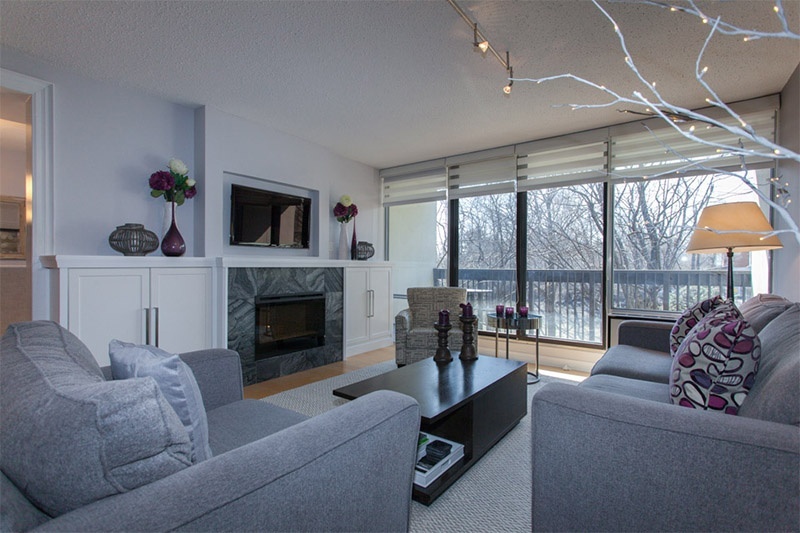 This designer, renovated 1130 sq ft condo rings every bell & blows every whistle! The 3rd bedroom has been opened up and is currently being used as the dining room. A very easy conversion will have it as a 3rd bedroom in no time. The choice is yours to do whatever suits your individual/family's needs! Pristine, wide plank maple hardwood floors throughout. Renovated chef's open concept kitchen! Maple cabinets & ample cupboard space, ceramic tiled back splash, slate floors & top of the line stainless steel appliances. Breakfast bar/centre island is the perfect spot for casual dining and appie's with friends. Ensuite locker makes for a convenient place for plenty of storage with slate floors just off the kitchen is an added bonus. 4 piece family bath just freshly painted with an updated vanity! Sliding glass doors walk-out to the completely private west facing balcony with cedar tiles overlooking the serenity of the park. The perfect spot to relax & enjoy morning coffee or an evening drink. Ensuite laundry with front loading washer & dryer are nicely tucked behind closed double doors -- Double front hall closet has lots of extra storage space for coats & shoes. Ownership of 1 underground parking spot and plenty of visitor parking for all the residents to enjoy! The current owners have enjoyed living in such a quiet, friendly, well-run building ~ a nice blend of friendly working professionals, families and retired empty nesters. A desirable neighbourhood & affordable all inclusive maintenance fees allowing for care free living & easy budgeting! Sought after Earl Haig Secondary School district! Earl Haig is known for its outstanding academic reputation, also highly regarded for its Claude Watson Arts program where students can major in dance, drama, music or visual arts. A vibrant and cosmopolitan urban centre filled with luxury condominiums, custom built homes, shining office towers, newly renovated shopping malls and theatres, world-class aquatic centre and the highly acclaimed Centre for the Performing Arts which hosts local and world class entertainment. A shopper's delight! The posh Bayview Village Shopping Centre located at the north-east corner of Bayview & Sheppard is known for its high end selection of clothing stores and restaurants. Sheppard & Willowdale Avenue provides residents with additional convenience- type shopping and a number of specialty service stores and professional offices. The Yonge Street shopping district offers a mix of small retailers, big box stores, one-of-a- kind specialty stores. This vibrant shopping mecca also features an international selection of restaurants including French, Italian, Greek, Chinese, Japanese and Middle Eastern foods. Plenty of wide open green spaces & parks surround! Sheppard East Park, Glendora Park, Rean Park, Willowdale Park, Hawksbury Park and Bayview Village Park to name but a few! The East Don Valley Parklands is an integral part of this family oriented neighbourhood. Lots of local recreation! The North York Civic Centre a multi-faceted facility that includes the Douglas Snow Aquatic Centre and the North York Central Library. Mel Lastman Square is equipped with a spacious amphitheatre, intimate wedding pavilions, garden court and a reflecting pool which doubles as a skating rink in the wintertime. The Ford Centre for the Performing Arts which includes the Art Gallery of North York, George Weston Recital Hall and the Studio Theatre. Desirable neighbourhood schools attracts many families with school age children! Hollywood P.S., Bayview M.S and the popular Earl Haig Secondary School as well as many private, Catholic and alternative schools nearby! Go green -- Walk to the Sheppard subway at the Bayview Station eastbound platform. There is regular bus service on Sheppard & Bayview Avenue providing connecting routes to stations on the Yonge-University-Spadina subway line. Motorists are approximately twenty minutes from downtown via Yonge Street or Bayview Avenue. Get in and out of the city in minutes via Highway 401 located off of Bayview, Yonge & Leslie Street. "Bayview Place" Condominiums were built in 1979 by the Cadillac Fairview Corporation. Consisting of 240 suites in a private park like setting. These pet friendly low rise 5 storey buildings are so much larger in size compared to other condominiums in the area. Amenities include an outdoor swimming pool, security system & visitor parking with excellent walking trails, tennis courts and playgrounds close by.